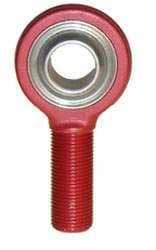 Fk Rod Ends - Circle Track Supply, Inc.
F.K. Bearings came onto the scene quietly over 24 years ago. They did not make a huge splash, but quickly won the customers over with fair pricing, and plenty of inventory. While the industrial market struggled to get product from the old stand-bys, the racing market embraced a supplier that would maintain inventory throughout the limited season. Recently, to further assure timely delivery, F.K. Bearing set up two regional warehouses. Filled to the brim with inventory, these warehouses can offer localized service for emergency orders. Over the years the F.K. Bearings product line has grown to encompass many different industries. From the wilds of Baja Mexico, to the "good old boys" of NASCAR....from mowers to care for your lawn, to fitness equipment to groom your body, you'll find F.K. Rod Ends! In your hands is our latest offering in an evolving program designed to supply rod end products to users everywhere! You will find rod ends and spherical bearings made from mild steel, chrome moly/alloy steel, aluminum, and stainless. Special care is taken during every step of the manufacturing process to insure you the highest quality products.